August | 2011 | gawa. Finally got the Fit kinda done for the year. Haven’t driven it much at all. Filled up twice, went about 800km or so for all of 2011 and it’s nearly autumn. But anyway, finally got a chance to take some shots of the completed 2011 form. Swapped the SSR Vienna’s out for the Lover Soul’s again, probably will retire them sometime next year to find something new to run. The big thing obviously this year is getting boosted, running a bolt-on turbo kit from Greddy, installed & tuned by Advance Power House. Also got some titanium dress up bolts from Tangent Bolts. Some new interior bits too, a Momo race wheel, Daikei hub and Works Bell Rapfix quick release. Definitely want to get rid of the Momo Race wheel but ehhh.. using it as a beater wheel in the meantime isn’t such a bad thing. Steering position is greatly improved with the extension of the quick release though and I’m loving where it sits right now. OE side mirrors with blinkers as well were a small addition this year. And finally, a bit of a work in progress but I’m working on the trunk and audio. Definitely need to do something with the ugly box and amp though. couple older shots of the fit. Took some shots with a fellow Fit owner a month ago or so. 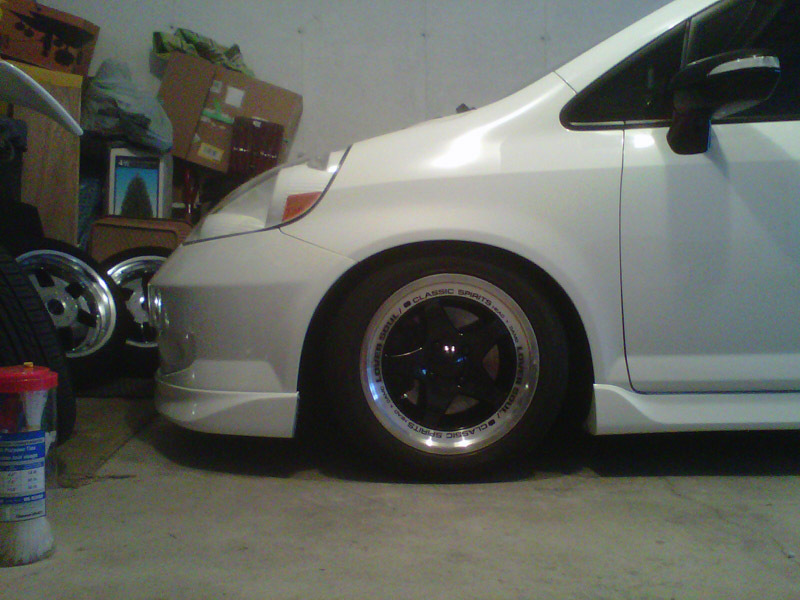 Spaced out MF8’s look pretty awesome on the Fit, though… his tires look like monster truck tires compared to my skinny ones though. noblesse at it again with the ge fit.